After a career of writing contemporary romance novels under a pseudonym, Lisa Chaplin's debut historical novel under her own name is a gem. The Tide Watchers is a quasi-fictional exploration of Napoleon Bonaparte's long rumored attempt to invade England via the English channel in the late winter of 1803. Coming on the heels of the 200th anniversary of the Battle of Waterloo, this story is especially timely and engaging. As a fan of this time period in British and Continental European history, I was thrilled when the opportunity to read and review this novel was presented to me. Duncan Aylsham, Commander and King's Man (spy is an apt term), is sent on a mission to find the daughter of his mentor, Sir Edward Sunderland. Lisbeth Sunderland, in direct defiance of her father's plans to arrange a marriage to a baron's heir, hastily married Alain Delacorte and ran off to France with him. Not knowing Delacorte's true nature, origins and purpose, she is brutalized at his hands and is forced to live apart from him and their newborn son. Duncan tracks her down and in rescuing her, comes to respect her for her intelligence, cunning and capability in outsmarting her husband and her enemies. While fleeing France, the two are caught up in a dangerous and ingenious mission to save Britain from invasion. Chaplin seamlessly injects real-life historical figures into the narrative. At times, I had trouble remembering who was fictional and who was not, and this is by no means a criticism. It made the book come alive for me. We are introduced to Bonaparte and his minions, all cogs in the wheel of the vast changes sweeping France and Europe at that time. There are various representatives of Whitehall in their official and unofficial capacities. We also meet Robert Fulton, the American inventor, as both he and his inventions become an integral part of the plot's narrative. We are therefore introduced to spies and counter-spies, double agents and other characters who are thrust into the roles necessary to protect their country and the people they love. Georgiana Gordon is one, as are Alec and Cal Stewart, Duncan's half brothers, forever coming to Duncan's rescue when he needs them the most, despite Duncan's repeated attempts at pushing them away. 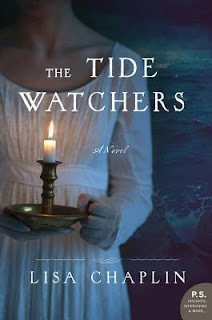 Besides a great swashbuckling tale of intrigue, double crossing, military might and sheer courage, The Tide Watchers brings us gentler lessons in the importance of family, however one can define the term. Duncan's relationship with his brothers, his father's family, his perfidious adoptive father, and Eddie Sunderland, his mentor, are all examined. On Lisbeth's side, there is an exploration of her relationship with her parents, especially her father, away most of the time on King's business as she grew up. And yes, there is romance, but it is not the main emphasis of the story. All of this adds a nuanced level to this novel that would keep anyone turning the pages, even those of you who are hard-core romance readers. There is something for everyone here, and I guarantee no one will close the back cover disappointed. My greatest find is a book that leads me to feel that I've learned something when I put it down for the last time. The Tide Watchers leaves me with that feeling. Pair intricate, intelligent prose with exceptional story-telling highlighting characters that are hard to forget, and you have a story more than worthy of your time. I can hardly wait for Ms. Chaplin's next foray into historical fiction. There are several characters here more than capable of carrying their own stories and I look forward to reading them. Highly, highly recommend!